President Trump addressed Chinese and Japanese currencies last week and reiterated his call for a “level playing field” for currencies. This week we revisit China and emerging markets where we remain underweight in the diversified core of asset allocation portfolios. 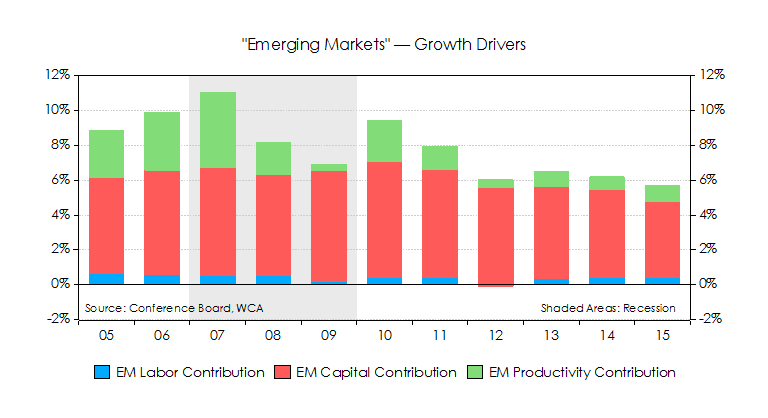 Emerging markets (EM) are delivering less growth than they used to, but remain risky. 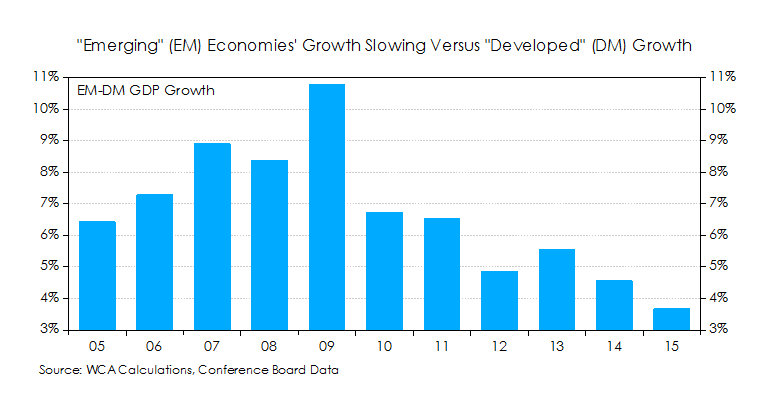 Chart 1 below shows how EM growth is converging with developed markets in recent years. Potential growth is dampened by slipping productivity (green) and capital investment (red). These factors explain most of the moderation in EM growth in recent years. 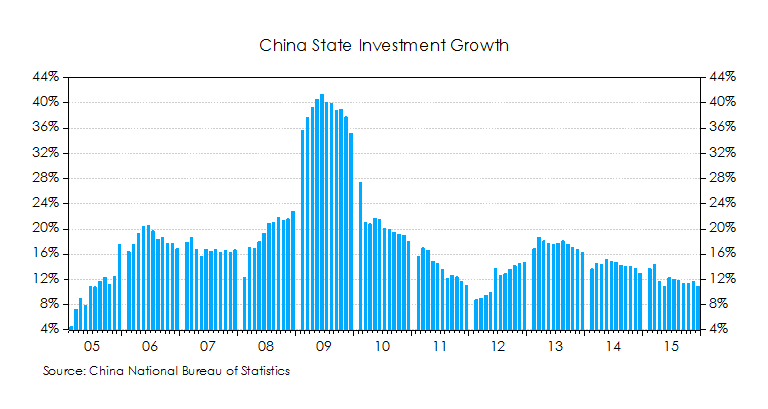 Rapid credit growth accompanied large increases in Chinese investment in infrastructure from 2000-2009 (Chart 2). Today, we see that China still exercises sway over global demand. Chart 3 shows how changes in Chinese state spending followed the same broad outlines as EM growth since 2005. Early in 2016, the Chinese government announced a Keynsian-style stimulus to shore up faltering growth. 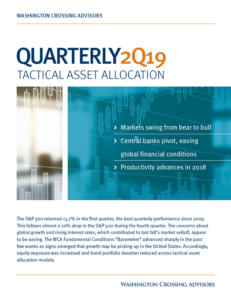 That stimulus boosted global demand, commodity prices, and inflation measures throughout last year. Even today, we see that most of the near-term indicators out of China are favorable. These non-Chinese government sources of data seem to paint a picture of modestly positive momentum early in 2017 for China. This bodes reasonably well for emerging markets, in general, although it does not signal the “all clear”, in our opinion. While emerging economies continue to offer more growth than developed, we remain underweight EM. We moved from a zero weight to an underweight position at the start of this year. Our models suggest undervaluation for emerging markets, but we are yet to see a compelling turn in growth rates. Not only are growth rates converging, but longstanding EM risk factors remain. Rapid accumulation of credit increases risk and total debt has been rising faster than EM output recently. Higher debt loads, coupled with limited government ability to respond to shocks, increases EM’s cost of capital. 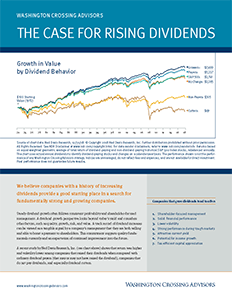 In turn, capital investment and productivity growth are both contributing to slower growth. This negative cycle began with a credit-driven boom and will take time to play out.